With the help of WeGrow, you’ve been perfecting your harvest; germinating your seeds, watching them grow into seedlings and eventually adult plants. Since then, you’ve harvested your plants and trimmed your dried buds to perfection. 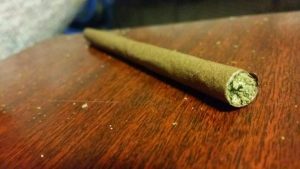 It is now time for you to reap the benefits of your harvest by rolling and smoking a blunt! Smokers coined the term based on how the finished rolled product looked like an unshapely blunt object such as a baseball bat. Puffers usually use brands such as Phillies, Goodtimes, Games and Garcia y Vega. Take your cigar and split it evenly down the middle with a blade. If you are using your fingers, start from the top then lightly pull apart the cigar until it has been fully split. Once you have split your cigar, dispose of the excess tobacco. Gently and evenly wet the inside of the cigar with your saliva or water to make the leaf more flexible. Add your freshly ground up cannabis to the lightly moistened cigar evenly from end to end. A rule of thumb is that the tapered end of the cigar or cigarillo is usually reserved to be the ‘mouthpiece’ of your blunt. Once you have added your greenery, using your thumbs in the front and your index fingers behind the blunt, carefully roll your thumbs and index fingers together to compact the ground bud into a log that fits snugly inside. Take the side of the leaf that is facing you and tuck it behind the rolled cannabis. Begin the tuck from the mouthpiece all the way until the end of the blunt. A general rule of thumb is to tuck with the natural weight of your thumb. Once you have tucked the forward part of your cigar behind your cannabis, it is time to seal your blunt. You can do this by utilizing the “lick-by-lick” method in which you make your way from the mouthpiece to the end whilst tucking. You have now rolled your first blunt! Enjoy! Be sure to follow WeGrow for exclusive tips, tricks, and news on cannabis cultivation culture!